Through the on boarding experience you have the option to allow users to specify how they like to be active. 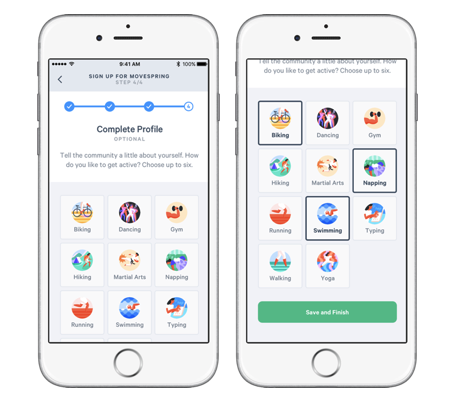 Not only does this allow you to better know your users, but it also gives them the opportunity to connect with their colleagues of similar interests and add some flare to their profile. Participants can select up to 6 different activity styles or skip this step. If they don’t select their activity styles through the on boarding process they can always add it from their profile at a later time. You will see all their activity interests appear in the User Report under the Activity Styles column separated by commas. As an admin, use these activity styles to create programming and groups for participants with a shared interest. Please reach out to your client success manager should you have further questions around this feature.